CAPE ELIZABETH — Cape Elizabeth and York went into their the Class B volleyball semifinal Wednesday night with a vast disparity in postseason experience. The Capers are seeking their third state championship in five years, while York had only one playoff win in three years at the varsity level. On Wednesday night, top-ranked Cape Elizabeth showed its experience with a near-flawless performance in a 25-14, 25-16, 25-6 victory. For the fourth-seeded Wildcats, nerves showed against the Capers, winners of 32 of their 33 matches over the last two seasons. The defending champion Capers (15-1) will face No. 2 Yarmouth at 6 p.m. Saturday at South Portland High School. The Capers have lost only four sets all season, three in a defeat against Class A state finalist Falmouth, and one in a 3-1 win over Windham. 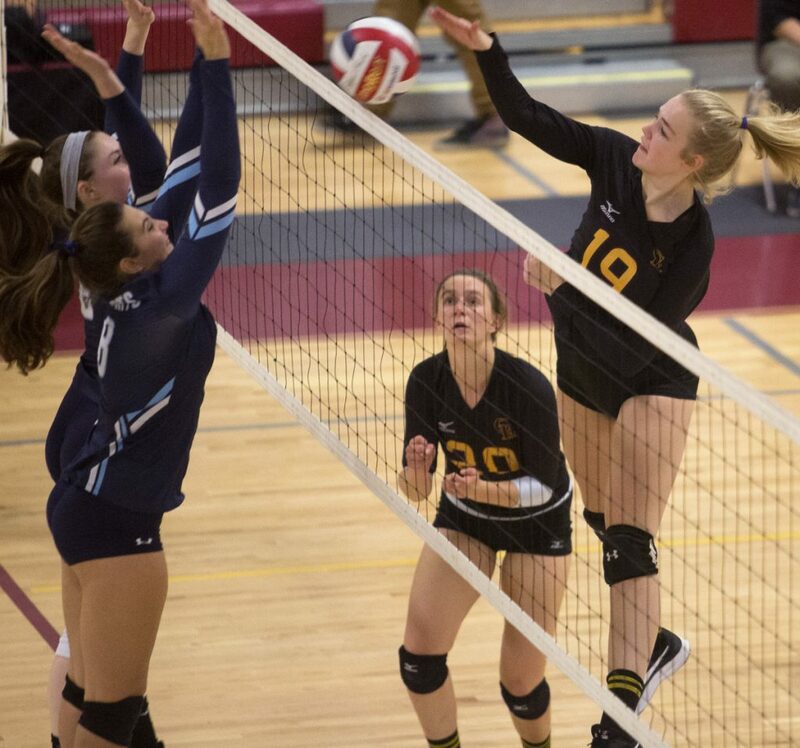 “Making it back to states has been our goal all season,” said senior hitter Bridget Heggie, who tied with Megan Connelly with a team-high seven kills. “We had some ups and downs this season, but at the beginning of the season we wanted another Gold Ball. York (10-6) couldn’t carry over its momentum from its quarterfinal win against Gardiner, though the Wildcats did give the home team a scare in both the first and second sets. Early in the first set, neither team could grab more than a three-point lead until Cape’s Aerin Manning served seven straight points for a 16-6 advantage. York misfired on four kill attempts and had two double hits on sets. Emma Parrotta got three points back with her hard serve, recording two aces, but the set ended with three straight points on Julia Torre’s serve – one when York hit the net, one on a Heggie kill with no blockers in front of her, and an ace when two York players let the ball drop. In the second set, two Jaya McClure kills off sets by Corina Page (game-high 17 assists) gave the Capers a little breathing room at 19-16. Manning put the game away with six straight service points – three of them aces. The Wildcats have a bright future ahead of them with only two seniors. They were led by juniors Sophie Trafton (eight assists), Parrotta (six kills, three blocks, five aces) and Abby Orso (four kills).